What is going on in this classroom? 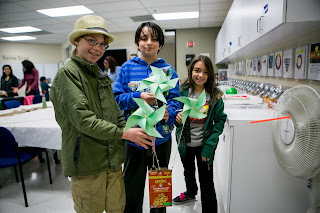 There are kids everywhere excitedly making, testing, remaking, retesting, hot gluing, hammering, there is so much duct tape! This is what engineering looks like in a middle school science class. This is excited, meaningful learning. How did I get to this place where I feel comfortable facilitating such an active engineering process with my classes? As a science teacher I have had practice with hands on, inquiry based labs, technology and math makes their way into those labs easily. But, engineering had me stumped. How was I going to be an effective engineering teacher as required with the Next Generation Science Standards (NGSS) when I knew so little about engineering? This is where RAFT and their STEM workshops really saved me and gave me the courage to start engineering projects. I started with a somewhat common misconception of what engineers do. I thought engineering was going to be a lot of sharp mechanical pencils, hours of computer simulations, and very complicated mathematical computations that were just not within my grasp let alone my students. This is not what NGSS expects at all and age appropriate engineering is both accessible and engaging. RAFT is the place to get all the building materials you need for your engineering projects without zeroing out your yearly budget. 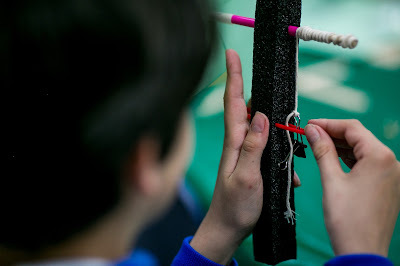 The range of supplies needed for various builds can be staggering from making a mobile birds nest that will maintain proper temperature for life (lots of foam, cardboard) to making a Rube Goldberg inspired machine (wood, string, pulley systems, balls, etc). No worries with RAFT you are covered in a few trips to the warehouse. Have fun putting the E in your STEAM class!